In the backcountry, a good wind-blocking fleece glove is so useful I tend to carry a pair almost regardless of expected weather conditions. 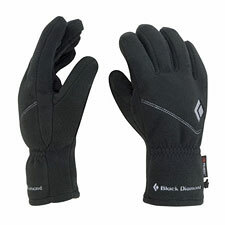 Black Diamond's Windweight gloves seem to exactly hit the spot between too light and too bulky, allowing you to climb and ski in comfort. They're dexterous enough to permit fiddling with buckles and gear without having to pull off your gloves, but they're also warm enough to keep your fingers from freezing when a powerstretch liner isn't enough. Black Diamond's system now considers these a liner glove, meaning you can pair them with other Black Diamond shells for foul-weather use. And, of course, you can use them on their own as a spring glove—with surprising versatility. Following my brother's example, I've found these warm enough to use as a Alpine ski glove when the temperature is above 20° F or so. Yes, that includes in-bounds skiing on chilly December mornings. The Windweight glove also makes an excellent around-camp glove for winter camping. In summer months they'll get you through everything but a rain storm when you're peak-bagging. The Windweight Glove features a Pitard's suede palm patch for extra grip on ski poles and smooth ice tool shafts. That said, grip remains something of a disappointment—better, to be sure, than a pure fleece palm, but not really good enough when security matters. For technical applications, you'll likely want a more dedicated climbing glove, like Black Diamond's Torque. Weighing a modest 2.9 ounces per pair (men's medium), the Black Diamond Windweight glove is easy to toss into your pack as a backup. In most conditions, however, you'll probably find yourself wearing these as if they were your primary glove. The WindWeight has enough insulation to keep your hands warm in quite cold conditions (within reason!) while offering the comfort and feel of a light spring glove. Recommended!